The Gordon Square Hub at W. 65th Street features a noon $1 screening of Pee-Wee’s Big Adventure at the Capitol Theatre, an Open Streets 1 and 2 mile dash kicking off at 1:30, and youth dance, Zumba, yoga, and pilates throughout the afternoon. Music will be provided by DJ Blackfire. 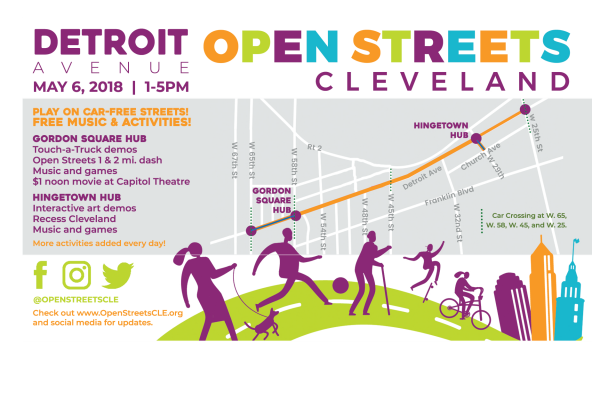 May is National Bike Month, and Open Streets Cleveland is the place to be to get ready for the season! Free bicycle safety checks, youth helmet giveaways, and a bicycle skills rodeo course will be available, along with a helmet decorating station, smoothie-making blender bicycle, bicycle polo, and a demonstration of the proposed Midway Protected Cycle Track. Resource partners include Brick House Wellness, Cleveland Transformation Alliance, Perfectly Imperfect Produce, Drink Local. Drink Tap., Cleveland CycleWerks, GAP Trails Alliance, Bike Cleveland, Cleveland Department of Public Health, Two-One-Fix, and the Ohio City Bicycle Co-op. Black Market Yoga is leading Yoga in the Streets in front of their studio at W. 54th St. at 1:30pm and 3:30pm. The Touch-a-Truck Hub at W. 45th St. presents the opportunity to sit in the seats of some of Cleveland’s biggest and loudest vehicles. Cleveland Fire, Police, and EMS, MetroHealth LifeFlight, RTA KidsWatch, Mom’s First, and University Hospitals Bike Medics will be on hand. Resource tables include Lifebanc, Cleveland Community Relations, United Healthcare, and the Detroit Shoreway Community Development Organization Safety Committee. Play basketball and other pickup games to tunes from DJ Tito, the Party Rican. Resources and demonstrations from TITLE Boxing, Mariner’s Watch, the Music Settlement, the Centers for Families and Children, Cleveland Rocks!, and ICA Art Conservation will be available. 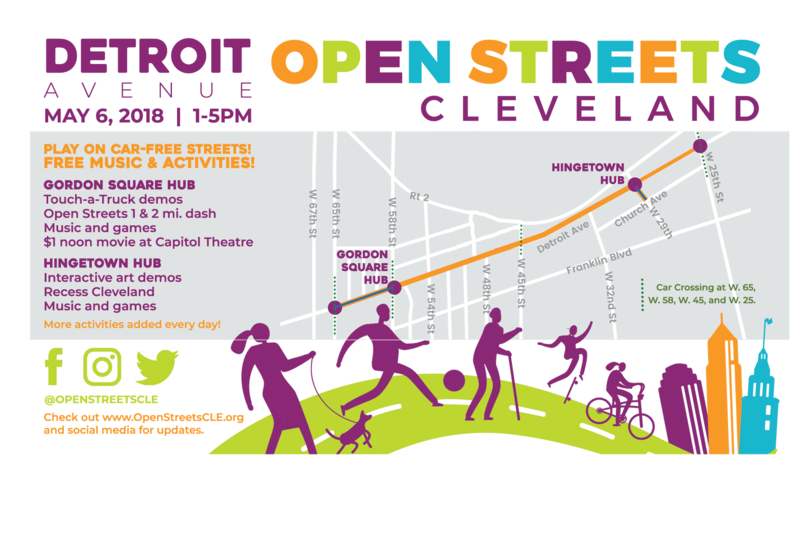 From 12:00 to 6:00, Detroit Avenue will be closed to cars for the Open Streets Cleveland event. Cross traffic will be permitted at W. 25th Street, W. 45th Street, W. 58th Street, and W. 65th Street. The event is accessible by foot, bike, and transit, as well as personal vehicles. RTA serves the neighborhood with bus routes #22 (Lorain Ave.) and #26 (rerouted to Franklin Blvd. during event). The Red Line also stops just a few blocks south of the Open Streets route at W. 65th Street. UH Bikes has stations at W. 29th Street and W. 58th Street. Ample bike parking is located along the Open Streets route. Thanks to our Neighborhood Sponsors! For more information about Open Streets Cleveland, including to sign up as a programmer, volunteer at the event, or sponsor, visit www.OpenStreetsCLE.org.